At today’s SMM Dads and Daughters event at Winona Lake (IN) Grace Brethren Church, the girls led their dads in a participatory exercise about missions in Argentina. The Winona Lake (IN) Grace Brethren Church/Jefferson Elementary School SMM program concluded its program year this Thursday afternoon with a special “Dads and Daughters” event that included a picnic lunch, prizes, presentations by the girls, and some special awards. Approximately 80 girls, grades 1-6, were enrolled in the SMM program this year, meeting Thursdays after school in the elementary school building which is across the street from the church building. Headed by Sharon White, the staff of nearly 20 women, college, and seminary students that helped with the program led the girls each Thursday in crafts, games, songs, scripture lessons, and refreshments. “A Girl After God’s Own Heart” was the theme for the year. At the closing event the girls performed several songs for their fathers, in English and in Spanish, and led the dads in a participatory reading about South America, the continent the girls’ missions emphasis focused on this year. 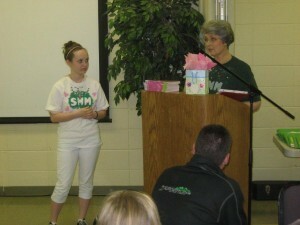 Katie Yocum (left) received a special award for her years of involvement in the SMM program. Katie Yocum, daughter of Mike and Carrie Yocum of Winona Lake, was honored for seven successive years of involvement in the SMM program. 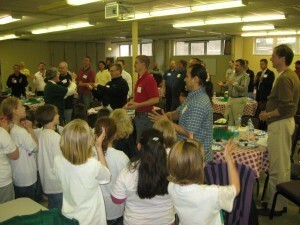 Partly because of the success and popularity of the girls’ program, midway through the current school year a companion program for boys was begun at the school, as well. It is being led by Dr. Rick Roberts of the Grace College faculty, who previously was a children’s pastor. I am so grateful to read of the wonderful afternoon you had with Dads and Daughters! Thank you goes to Mrs. White for her fine, caring leadership this year! I am praying for God's richest blessings as plans are made for another year in SMM.